After it was mentioned in class that we could recreate a classic image, all I had in mind was René Magritte’s ¨Le fils de l’homme¨ painting. I kept wondering why a bowler hat and why an apple? Why a fruit in front of the man’s face? Since I wanted to recreate the image, but with a twist, I decided to incorporate that questioning into the concept. 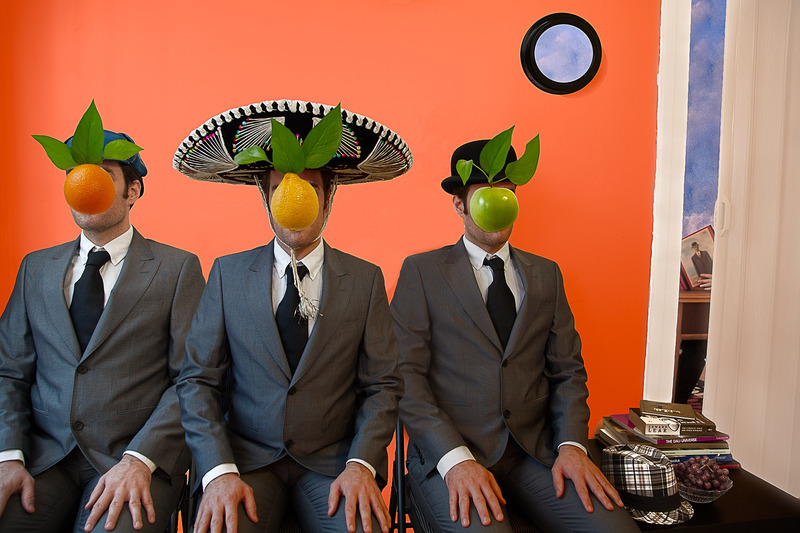 I borrowed different hats and gathered different fruits, and I tried to recreate a scene (a bit abstract I admit) where people with fruit for a face were waiting to meet the artist and have their portrait painted. In this fantasy world, men are all the same, except for their hats and fruits, so I used the same model for all three characters. I added some art books on the table, to make it look a bit more like an artist’s house (and not just my kitchen), as well as another hat and some fruit, as if somebody had gone for a minute (maybe he is chatting with the painter or you can actually switch the items?) You can also see that the wall in the back room is all sky, because I wanted to add that bit from the painting (I used the same colour palette as well). I also added another character in that room, who is busy reading the documents about the project….I bit off more than I could chew with this one, because the photoshopping involved was definitely out of my range, but I think I managed to do a few things right!